He seems like a good culture fit in terms of style and personality, he has experience running a 3-4 defense and ran a great one in 2011 for the Ravens, and he has valuable big game experience as a HC. Pagano can be trusted to run the defense in the same way as Fangio and like Fangio he will not be jumping in front of the camera whenever it is near by. The DB background is something I like as well as that is the most complex part of the defense. I am going to ignore the 1 year mess in Arizona. Wilks was a very good DB coach in Carolina and he had 1 good year as a DC. He can come in and fill the DB coach role, as long as he does not get a DC job, and he gives the Bears a potential transition if Pagano gets back into a HC role. I think Massie will get another deal that pays him in the 6 million range and that is too much for him. He is not 5.5 million better than Rashard Coward. The Bears need to go cheap at RT as the free agent class is no inspiring and they do not have the money to spend big here. OG Kyle Long, convert 5 million of un-guaranteed money into incentives, saving 5 million. This is really a 1 year 4 million dollar deal that protects the Bears, but turns into the 3 year deal if Callahan stays healthy in 2019. Callahan emerged as one of the best nickle backs in the league and to me should prioritized over Amos who I think will make more money than the Bears can afford to pay him. This signing will be unpopular with some, but the Bears are in the cap situation where they need to look at all possible market inefficiencies that they can possibly get. Kareem Hunt is a Pro Bowl talent, that the Bears can add for cheap, because of their coaching connection and he could provide a value that far exceeds his contract. That is the Bears financial reality, and with Howard leaving after the 2019 season, you have Hunt in place on a cheap deal so he can rehab his image. I expect Hunt will be suspended for at least the first 4 weeks of the season so the Bears need to keep Howard and maybe move him at the trade deadline. I am not sure what Adam Shaheen is at this point, he has been hurt a lot, and at times looked like a competent pass catcher. He also looks too slow to be a real passing game threat. This left the offense in a bind when Burton freaked out and could not play in the playoffs. The Bears need to add someone to protect against exactly what happened in the playoffs. Williams is a former 2nd round pick who never really got his footing in Baltimore and has the athletic ability to play the Burton role if needed. The Bears need a backup veteran safety that they can play in case of injury or if Bush really struggles as a starter. Parker is 32 so long term he is simply a place holder, but he continues to produce, grabbing 3 picks last year and he can fill that veteran leadership role while backing up at FS and SS. The Bears need some speed at RB that Benny Cunnigham does not bring. McKissic had an injury plagued year in Seattle, but in 2017 he averaged 4.1 YPC and had 34 catches for 266 yards for 7.8 YPC. McKissic is a converted WR and really had upper level hands and route running for a RB and can be the passing weapon that Mizzell simply is not. The Bears need a 6th DLmen to be inactive on game days that they can have for depth and that has a little developmental upside. Heath has the size 6'6" 300lbs, and flashed a little for the Texans in his first 2 years with 3 sacks and a handful of starts. The Bears can see if they can spark Heath after a down year and get a little depth on the DL. This just makes too much sense. Robbie wants to come back, his wife and 2 sons and new baby all live in Chicago and he has talked about how hard it is to be away in the season. The Bears need someone reliable and it doesn't get more reliable than Gould right now, and he has experience at Soldier Field. On the Hoge and Jahns podcast they talked about how Gould would more than likely take a discount to be close to his family. I want to trade down and add a ton of young and cheap depth to develop, but I think that is a risk when you need a potential starter at OT. 3 OT Scott Frantz [Kansas St] 6'5" 300lbs. The Bears need legit competition for Coward at RT and they need a better option that Bradley Sowell as a potential long term starter at LT if Leno goes down. The Bears have been blessed by Leno's durability, but if he missed a long stretch of time, playing Sowell would be a mistake and a waste of reps. Frantz has good athletic ability, a good frame, and is very technically sound. He has the athletic ability and movement skills for the screen and jet sweep game. He will need to get stronger, but I believe he can compete in camp year 1 to play. If Coward plays well Frantz will be moved inside and worked to replace Long at RG in 2020. 4. 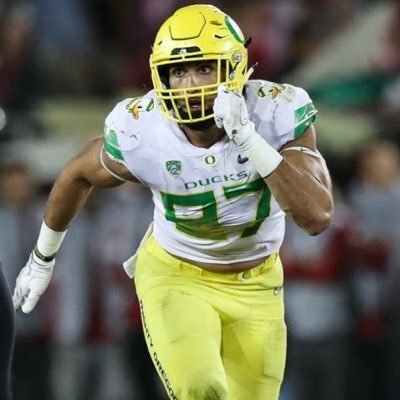 OLB Jalen Jelks [Oregon] 6'5" 245lbs. The Bears need to add a potential #3 or #4 OLB and someone with some athletic upside. Jelks has the size, length, and freakish athletic ability to play the position and do what the Bears need. He is not a polished player, he really only has 1 pass rush move, and he will require some coaching, which the Bears have. This is an upside pick and hopefully someone who can step in and rush the passer a little and provide some speed when Floyd is not on the field. 5. CB Trevon Diggs [Alabama] 6'1" 190lbs. The Bears need to start thinking about a long term plan to replace Prince in 2020 as I think when the young guys start to get paid, he will be a cap casualty. Tolliver flashed a little this season, but the Bears should continue to add developmental options for Ed Donatell to work with. Diggs has the size and physicality that the Bears like across from Kyle Fuller and you know he is well coached and will tackle. Tolliver vs Diggs to start in 2020. 7. P Mitch Wishnowsky [Utah] 6'2" 225lbs. I am not paying O'Donnell to shank important punts and I am not investing real money in specialists that make them impossible to replace when they break down. Wishnowsky is one of the best college punters in the nation, he has a big leg, he has kicked in the weather in Utah, and considering most 7th round picks do not make teams, this guarantees that this pick makes the team. 7. OG Alex Bars [Notre Dame] 6'5" 315lbs. The Bears need to start thinking about who will be playing RG in 2020, because more than likely it is not Kyle Long who makes a ton and has been beaten up. The Bears could really use for a much cheaper option to step into that spot and allow them to shift some resources around. Bars is probably a 3rd or 4th round pick in most drafts, but he tore up his knee and he is more than likely going to fall. 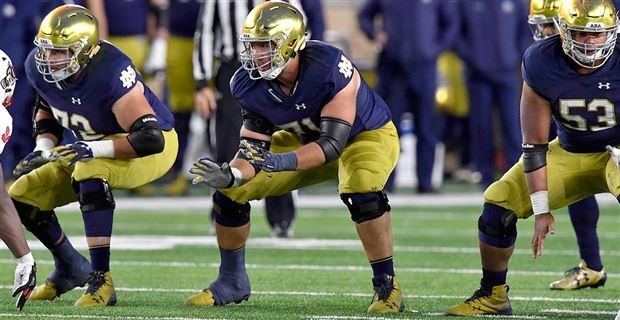 Bars is big, well coached, and has a connection with Hiestand. The Bears can draft him, let him get healthy, and then add him to the 2020 competition. This is where you will be rewarded for a quieter 2019 free agency period and some of the Bears guys walking for more money elsewhere. As the Bears approach having to pay Trubisky, this year with a ton of developmental picks is going to be huge as this is the best and cheapest depth. I'd love this offseason. I'd try real hard to sign one of Lynch or Amos though instead of spending money on Max Williams and Ron Parker. You might want to look at CJ Uzomah. Looks like an under rader good big athlete. Nice work but I don't think in a million years the Bears' Brass will sign off on Hunt. Coming out of college, I thought maxx Williams was a raw stud and had tons of potential. He was buried by Crockett Gillmore, Ben watson, and Dennis pitta and then never really did much in the time he was in. I’d be okay with the signing but don’t think he’ll ever amount to the potential I thought he had. Would be 100% for the signing of Kareem Hunt and Robbie Gould too. I think it's possible because he played for Nagy and Nagy has bargaining power to pound the table get what he wants on some things. I dont know if its that important to Nagy to get him. The draft I would love but struggle to see Jelks or Diggs being there at that point. We are in the phase of team building/cap space where we need to take some risks on talented players that come at discounted rates. Hunt is a market inefficiency, because of his arrest, that teams like the Rams and Patriots take advantage of. I 100% agree. This decision will be in Pace/Nagy's hands not Virginia. She's a figure head not someone who can make day to day decisions.